Seal of the Virginia Company. 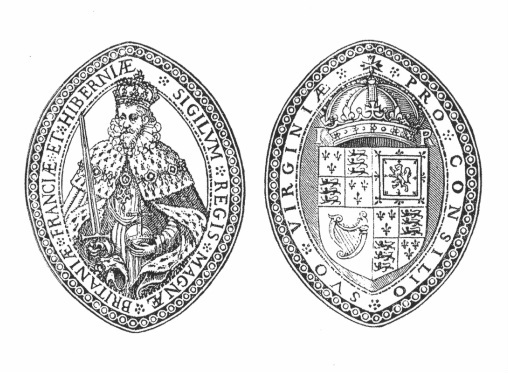 The seal of the Virginia Company was granted April 1606 by King James I to the incorporators of the Company. The obverse of the seal shows the arms of England; the reverse shows King James I. ​We will begin discussion of the Jamestown Colony with Bartholomew Gosnold (1572 - 1607) an English lawyer, explorer and privateer, who was instrumental in founding the Virginia Company of London, a prime mover in the colonization of Virginia and establishing the Jamestown Colony. Gosnold was born in Grundisburgh in Suffolk, England in 1572, and his family seat was Otley, Suffolk. He graduated from the University of Cambridge. Bartholomew Gosnold's parents were Anthony Gosnold and Dorothy Bacon. Anthony Gosnold was the son of Robert Gosnold of Otley and Mary Vesey. Robert Gosnold, grandfather of Bartholomew, is a Bedinger ancestor, he being an ancestor by two lines: one, by Sarah Keene, first wife of George Michael Bedinger and, the second, by Judith Singleton, the wife of Henry Clay Bedinger. Bartholomew Gosnold sailed from Falmouth, England in the Concord with 32 on board. They intended to establish a colony in New England. They arrived at Cape Elizabeth in Maine and skirted the coastline for several days before he sailed into Provincetown Harbor where he named Cape Cod, later discovered Martha's Vineyard and named it after his daughter, Martha, and established a small post on Cuttyhunk Island. The post was abandoned when settlers decided to return on the ship to England since they had insufficient provisions to overwinter. The settlement at Cuttyhunk in 1602 is depicted in the banner for this page taken from a painting by Albert Bierstadt. The English expedition of three small ships arrived at the mouth of the James River in April 1607. Captain Edward Maria Wingfield selected the site of Jamestown as the location of the colony. After the four-month ocean trip, their food stores were sufficient only for each to have a cup or two of grain-meal per day. Due to swampy conditions and widespread disease, someone died almost every day. In early January 1608 one-hundred new settlers arrived. That winter through carelessness the village was set on fire and the settlers were forced to live in the burnt ruins. Food supplies ran low and although the Indians brought some food, Captain John Smith wrote that "more than half of us died". Many of the men may well have died from drinking brackish creek water and from poor nutrition. In April 1608 a ship brought 50 new settlers whom Capt. John Smith set to construct housing and farm planting. In October a ship arrived with 70 new settlers including the first women, some German and Polish craftsmen, but hey brought no food supplies. Smith tried to get food from the Indians and it took threats of military force against the Indians for them to comply. Captain Smith called a meeting and threatened those settlers who were spoiled and not working "that he that will not work shall not eat…" After that the situation improved and the settlers worked with more industry, albeit with some punishments as needed. Some settlers wanted Smith to abandon Jamestown but he refused. Some deserted to the Native American villages, but Chief Powhatan's people also went by Smith's law which was: "he who works not, eats not". This was in effect "till they were near starved indeed" and they returned home. The weeks-long emergency was relieved by the arrival of an unexpected ship, captained by Samuel Argall. He had items of food and wine which Smith bought on credit. Argall also brought news that the (South) Virginia Company of London was being reorganized and was sending more supplies and settlers to Jamestown along with a new governor, Lord De la Warr. Sir Samuel Argall (1572 or 1580 - 24 January 1626) was an English adventurer and naval officer. As a sea captain, in 1609, Argall was the first to determine a shorter northern route from England across the Atlantic Ocean to the new English colony of Virginia, based at Jamestown, and made numerous voyages to the New World. He captained one of Lord De La Warr's ships in the successful rescue mission to Virginia in 1610 which saved the colony from starvation. As a sea warrior, he is best known for his successful diplomacy with the Powhatan Confederacy. He kidnapped the Chief Powhatan's daughter, Pocahontas, as security against the return of English captives and property held by Powhatan on 13 April 1613. Pocahontas had long been a friend of the English and was treated with great respect according to her rank, in the eyes of the English, as an Algonquian Princess. This action eventually resulted in the restoration of peace and trade relations between the English and the Powhatan Confederacy. Argall was also successful in his actions against French efforts at colonization in Acadia and North Africa which were upheld in London as violations of the Charter of the Virginia Company. Argall was accused of having been excessively stern in his term as Governor of Virginia and not having the best interests of the planters at heart. In May 1616, Argall returned to Jamestown as Deputy-Governor. Sir Thomas Dale, Governor of the Colony had established harsh martial law. When Dale left Virginia in May 1616, Argall came to power; he enforced the laws more severely. Argall left Virginia in 1619 with many charges against him. When his conduct was examined in London he managed to escape prosecution, possibly through his connections in England. Samuel Argall, in 1623, was knighted by King James I Argall and appointed Admiral of new England. Argall died at sea in 1626 at he age of 46 years. Samuel Argall, baptized 4 December 1580, was the fourth son of Richard Argall (c.1533–1588) of East Sutton, Kent, by his third wife, Mary Scott (d.1598), the daughter of Sir Reginald Scott of Scott's Hall, one of the foremost houses in Kent, by his second wife, Mary Tuke, the daughter of Sir Bryan Tuke of Layer Marney, Essex, secretary to Cardinal Wolsey. Samuel Argall's father, Richard Argall is an ancestor of the descendants of George Michael Bedinger through his wife Henrietta Clay. "Ancient planter" was the term applied to colonists who migrated to the Colony of Virginia before 1616 and who remained at the colony for at least three years. Under the terms issued by the Virginia Company of London in 1618, these colonists received the first land grants in Virginia. Four immigrants who fill the qualifications of "ancient planter" are direct ancestors of Bedingers:, John Claye, Thomas Farmer, Robert Beheathland and Mary Beheathland. John Claye came was one of fifty men, employed by the Jamestown Company, to Virginia in February 1613 on the ship Treasurer of Samuel Argall. John Claye's wife, Ann, came to Virginia on the ship Ann in August 1623. On January 21, 1625 John and his wife were living at Jordan's Journey (46). The family was in possession of a dwelling, an ample supply of stored food, defensive weaponry, and some livestock. He had a male servant who lived in the home with john and his family. John received a patent for a tract of 1,200 acres and purchased 1,000 acres with John Freme. John Claye is a direct ancestor of the descendants of George Michael Bedinger though his wife Henrietta Clay. Thomas Farmer, an ancient planter, came to Virginia on the Trial in 1616 and in February 1624 was living in Bermuda Hundred. In January 1625 when a muster was compiled of the community's inhabitants, Farmer was described as a 30-year-old household head. Although he lived alone, he was relatively well supplied with stored food and defensive weaponry. Thomas Farmer served as a Burgess in the March 1630 session of the colony's assembly representing the community of settlers residing on the College land in Henrico and Bermuda Hundred. Thomas Farmer is a direct ancestor of Bedinger descendants of Singleton Berry Bedinger Jr. through his wife Thelma Mae Showalter. The unusual Cornish surname "Beheathland" was represented in Jamestown by Robert, a gentleman and ancient planter who came to Virginia in 1607 with Bartholomew Gosnold, Edward Maria Wingfield and Captain John Smith. In 1608 he accompanied John Smith to Werowocomoco, Powhatan's village on the York River and to the Pamunkey Indians' territory. He also went on a voyage of discovery within Chesapeake Bay. By 1627 Robert Beheathland was dead, survived by his widow Mary, also an ancient planter, and his daughter Dorothy. Robert and Mary (Nichols) Beheathland are direct ancestors of the progeny of Elizabeth Conrad Bedinger through her husband John Thornton Augustine Washington. Nicolas Martiau was born at Ile de Re, France in 1591. Nothing is known of this youth except that as a protestant he espoused the doctrine of Calvin and learned to speak English by studying the Gospels and the Bible. He obtained education as a military engineer. Because of the political and religious context of the time he was forced into exile in England. In London he was a French Huguenot at the church of Threadneedle St. He became acquainted with the Henry, the Fifth Earl of Huntington, a member of the Jamestown Company of Virginia. The Jamestown Colony was in eminent need of military defenses for the Colony. Defensive structures were needed in the growing colony for defense against Indian uprisings and possible invasions by Spain. The Earl of Huntington, solved the problem of a securing military engineer by offering to engage Martiau and send him to Virginia at his own expense. The Earl of Huntington interceded with King James I to obtain English citizenship for Nicolas Martiau. Citizenship would allow Martiau all the privileges of an English citizen including the ownership of land and the right to vote and hold office. Captain Nicolas Martiau came to the colony in aboard the ship Francis Bona Venture in the spring of 1620. He settled at Elizabeth City where he was listed in the census, 1623/24 and also in the muster, February 1624/5 when his age is given as 33 years. For a long time the colony had been at peace with the Indians. Powhatan the father of Pocahontas died and was succeeded by his brother, Opechankano, “a treacherous son of the forest”, who looked with jealous eye upon the ever growing settlement. In March, 1622 he had completed his plans and was ready to strike terror against the English settlers. The Indians, pretending friendship, came with fruits, fish, turkey and venison to sell. They struck suddenly without warning casting disaster upon the settlement. Within one hour after the first war hoop, 300 men, women and children were massacred. Death raged for more than a hundred miles along both sides of the river James, leaving three hundred forty seven Colonists dead. Nicolas Martiau was placed in command of a company of men which ranged in the forest in search of Indians. Opechankano narrowly escaped with his life. In 1630 the region of the Indian settlement at Chiskiake on the Pamunkey (York) River was opened to English colonists. Nicolas Martiau patented 1300 acres in Charles River, now York, County. He moved to his land which encompassed what is now the city of Yorktown. It was on this land that Cornwallis surrendered his troops the Martiau’s great-great-great-grandson, General George Washington in 1781. Martiau later was granted 2000 acres on the south side of the Potomac River, which he gave Col. George Reade, his son-in-law, in his will in 1657. In 1623, in response to an investigation by commissioners of the crown, the House of Burgesses drew up a report recommending the most proper fortifications to be maintained against Indians or other enemies that may come by sea. The report was signed by the Governor and 31 members of the House of Burgesses, one of which was Captain Nicolas Martiau. It is assumed that the French military engineer who was brought to Virginia for “chusing and takeing some place of advantage and there to make some pallysadoes” for which he was reported “singularly good” was requested by his colleagues to prepare the answer to the question. The report includes recommendation for running a palisade from Martins hundred to Chiskiake (Yorktown). The men who helped establish the line along this new frontier included Captain Richard Townsend, whose patented land was to adjoin that of Nicolas Martiau. Homes were rapidly established in the Chiskiake settlement. By 1632 the development of the York River area was sufficient to call for an additional representative to the assembly. Martiau was elected to the House of Burgesses from “Kiskyake and the Isle of Kent” In 1632. Nicholas Martiau was among the first appointees as a justice, as was his neighbor Captain Richard Townsend. As a justice of York County, Martiau served from 1633 until his death in 1657. In 1625, Nicolas Martiau married Jane Bartley (Berkeley), the widow of Lieutenant Eduard Bartley. The children of Nicolas and Jane Bartley were Nicolas Martiau, who died before reaching majority, Elizabeth Martiau, married to Colonel George Read, Mary Martiau, married to Col. John Searsbrook, a leader in Bacon’s Rebellion, and Sarah Martiau, married to William Fuller the Puritan Governor of Maryland. The maiden name of Jane Bartley we do not know, nor do we know the parents of Nicolas Martiau. Elizabeth Martiau, daughter of Nicolas and Jane Martiau, married Col. George Reade, who was briefly the governor of the colony at the departure of Gov. Harvey. Elizabeth Martiau and George Reade are the great–great grand parents of Samuel Washington and his brother George Washington, General and President of the United States. Samuel Washington is the grandfather of John Thornton Augustine Washington who married Elizabeth Conrad Bedinger. The 1632 Assembly, of which Martiau was a member, drew up a set of grievances to be sent to the Privy Council in England, setting forth conditions in the colony which were a prelude to the “Thrusting out of Sir John Harvey” as governor of Virginia. In this first rebellion against autocratic rule, Capt. Martiau was a leader, having been one of the three spokesmen at a meeting of the discontented colonists held at Yorktown. 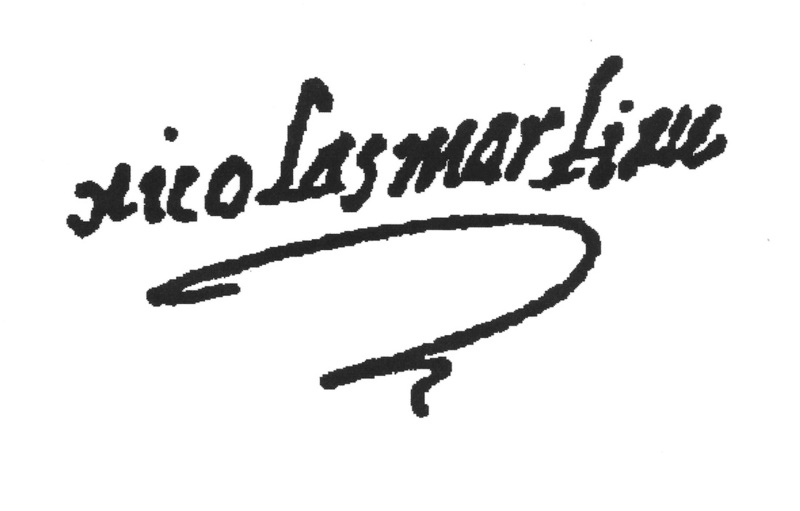 Captain Nicolas Martiau accordingly signed the petition in his bold hand. Governor Harvey flew into a rage over the grievances and had Martiau and the other two men arrested and sent to Jamestown in irons. In Jamestown, Harvey’s council refused to support Governor Harvey in his charges against Martiau, Francis Pott and William English. Nicolas Martiau boldly subscribed his name to the petition against the cruel dealings of unconscionable merchants. In further defiance of Governor Harvey, the council released Martiau and the other two prisoners and placed a guard around Harvey, ostensibly to protect him. The House of Burgesses met and approved the Council’s action. Harvey was forced to return to England. The King, Charles I, displeased with the colonists because they had refused to grant him a monopoly in the tobacco trade, ordered that Harvey must return to Jamestown, if only for a brief time. He returned with George Reade, a member of a distinguished family. Opposition to the continued high-handed actions of Governor Harvey compelled him to flee for his safety leaving George Reade temporarily in charge of the governorship of the Colony. as followeth: first I bequeath my Soule unto the hand of God my maker hopeing & assuredly believeing that when this life shall end I shall through the meritts of Jesus Chrst my Redeemer to injoy everlasting Rest and happiness. And my body to the Earth from whence it came to be decently buried. I give and bequeath to my Eldest Daughter Elizabeth wife of George Read Esq & the heires of her body begotten or to be begotten forever all that my Divydent of land situate lying and being in the sd. Parrish and county of York (Except as hereunder excepted) with all houses and appurtenances. I give and bequeath to my Daughter, Mary Scarsbrook, wife of John Scarsbrook so much of my sd. Divydent of Land in York Parrish as is situate and lying beyond the Swamp (vitz) on the Southward side of that Swamp called commonly Broccas Swamp upon part of which the said John is now seated to be held by the sd. Mary and her heirs lawfully begotten & to be begotten forever with appurtenances. which I hereby give & bequeath wth. the whole increase thereof to my Daughter Sarah wife of Capt. Fuller & her heirs forever. I give and bequeath to my loveing Daughter Mary Scarsbrook & her heirs forever the mare ffoale now runeing wht. my mare wth. whole Increase male & female. I give and bequeath to my loveing Daughter Elizabeth Read my Watch. expiration of time limitted by the Pattent for seating then the same to be made Sale of Executrix as hereunder named & the produce thereof to be equally dyvyded betweene my said three loveing Daughters for the good of them and their children. My Will is that within one yeare after my decease all cattle now in my possession marked wth. my Daughter ffulers mark shall be delivered for the good of her and her children & I doe also give and bequeath to her and her heires forever Tenn cowes more out of my Stock or to be brought out of my Estate with their whole increase male and female and also a bull to be delivered within a yeare as above said. I give to my loveing sonn, George Read, Esq. all my weareing apparel except my stuff suite and coate and new Dimity caster which I hereby bequeath to my Sonn John Scarsbrook and alsoe will that ffive pounds ready money now lying by me to be equally divyded between my said Two son in lawes. I give and bequeath to my above named Two loveing Daughters Elizabeth Read and Mary Scarsbrook for the good of themselves & their Children All the rest of my Estate whatsoever in Virginia or elsewhere to be equally divyded betweene thembut this divysyon not to be made untill all my Debts & Legacyes be satisfied which said severall Debts are to be paid out of the part of my Estate as is given to my said Two daughters & their Children without any Charges to my Daughter Sarah or her heires. lastly I doe by these presents, nominated & appointed & confirmed my two beloved Daughters Elizabeth and Mary joynt Executrixes of this my last Will & testament to see the same performed and kept And in confirmacon of this my last Will & Testament & of every matter course & thing therein conteyned I have hereto sett my hand and Seale this first day of March One Thousand Six hundred and fifty Six. Page modified 25 March 2015 to incorporate research on Samuel Argall by Elizabeth Tissot published in the newsletter of the Order of Descendants of Ancient Planters, vol. 24, no. 1, Spring 2015.